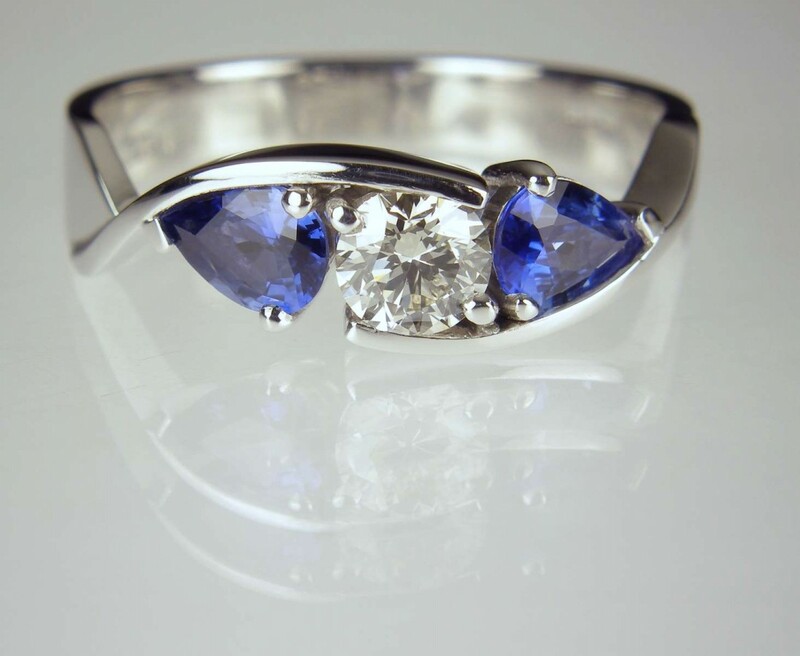 Using either our gems, or your own, we will guide you through the options for creating a beautiful piece of jewellery designed especially for you. Your individual requirements and life style will be discussed, so that the gemstones in your piece can be displayed to full advantage whilst protecting them from potential damage during day-to-day wear. Not all gemstones are equally durable and you will be advised, throughout the design process, on your choice of gem, precious metal and mounting style to ensure your finished jewellery will continue to sparkle for years to come. Once the design has been agreed, and pricing for both gem and manufacture finalised, you will be asked to confirm your agreement to the commission by paying, in advance, 50% of the final price. The 50% remaining balance is due when you receive the finished piece and it is to your complete satisfaction. All our jewellery is handmade by our expert British goldsmiths. Close consultation and attention to detail are important elements of our service. Each piece of jewellery is carefully made to optimise the physical properties of its gemstones and is unique. Are you looking for ideas for a special birthday or anniversary present? Would you like to discuss the cost of having an elegant and unusual jewel made for yourself or a loved one? 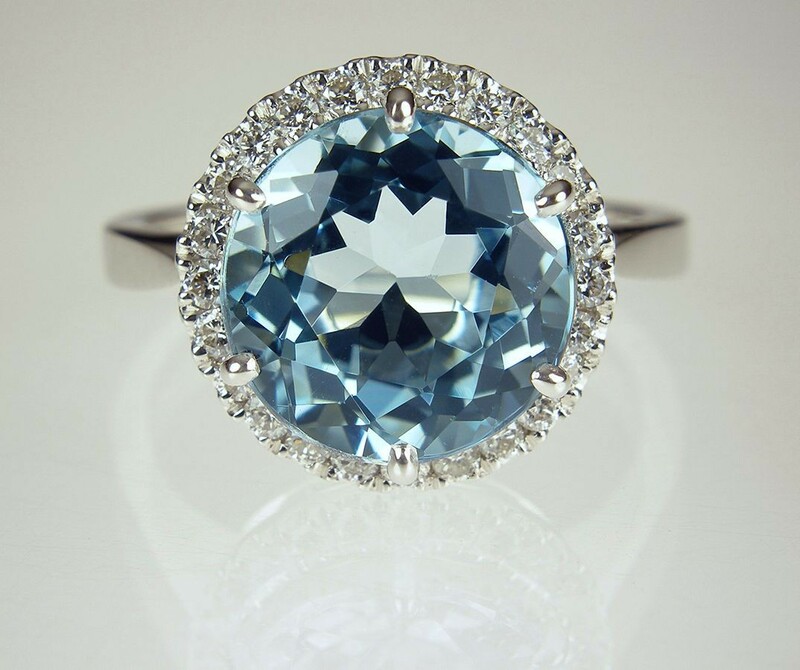 Come to Just Gems where you are guaranteed impeccable gemstones, competitive prices, flexible, candid and discrete sales service. See Contact or Shop for how to find us. Rare oil included quartz crystals from Balochistan are set in individually handmade gold mounts. The crystals are approximately 2-3cm in all dimensions and contain golden droplets of light oil, along with darker bitumen and an aqueous solution. The inclusions fluoresce a strong bluish green under UV light. Each pair of cufflinks comes with a UV pen torch and an explanation of the crystal. 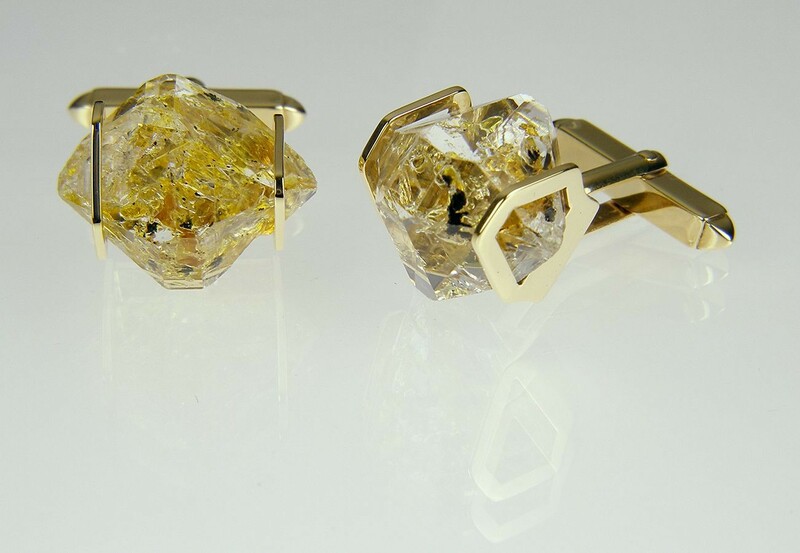 These crystals are extremely rare and it is difficult to find such perfect examples as sold by Just Gems. The setting is precisely made to fit each unique crystal and has to be created without the application of heat, which could cause the crystal to fracture. Each piece is handmade in Scotland and hallmarked in Edinburgh. Pendants and earrings also available. A selection of crystals are available for bespoke designs. 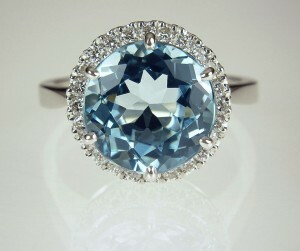 Aquamarine & diamond ring set with 11mm round 4.38ct aquamarine & 0.35ct diamonds in 18ct white gold.